The basics of winterizing an RV are about caring for the battery and emptying the water out of the plumbing system, with the option to blow out the lines or refill them with non-toxic antifreeze. A battery will lose its charge through non-use and if it sits partially charged it will lose its full power-generating ability. 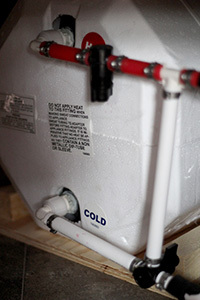 Cold will slow down the process and being connected to a possible power drain will speed it up. A charged battery should survive the freezing temperatures with minimal effect. The black water tank is done before the grey because water in the grey tank helps flush solids and septic residue in the flexible hose line. Once the tanks are drained, you must either remove any remaining water in the lines or add RV-rated antifreeze to prevent any remaining water from freezing. Blowing out the lines does not guarantee the removal of all of the water. Failure to drain the water completely, prior to freezing weather can result in extensive damage to the water lines, holding tanks, water heater and pumps. 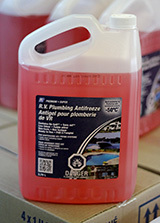 Automotive antifreeze should NOT be used in the drinking water system as it is poisonous! If your RV has water based appliances such as icemakers and washing machines, we recommend you have it winterized by a service facility. Book your winterizing service today!